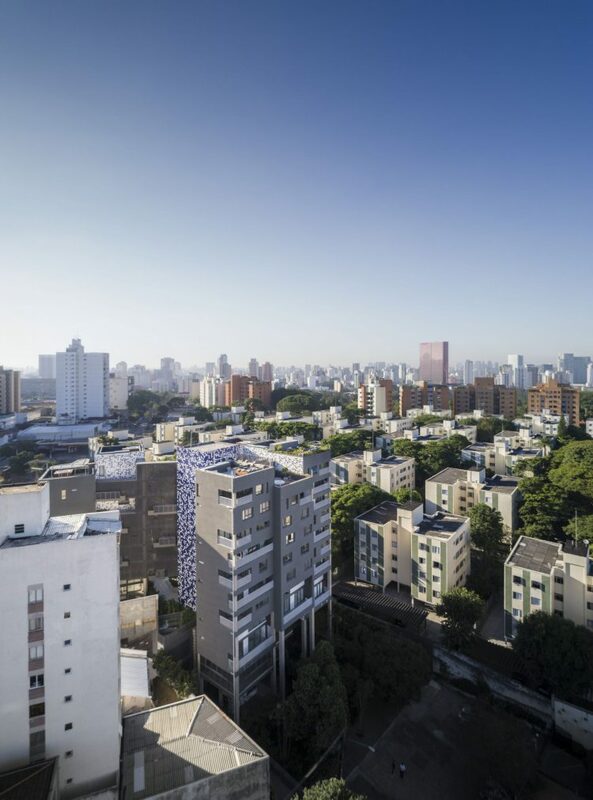 The specific setting of the Vila Madalena neighbourhood, São Paulo, defined the project created by Triptyque Architecture: a residential complex built on Arapiraca Street. 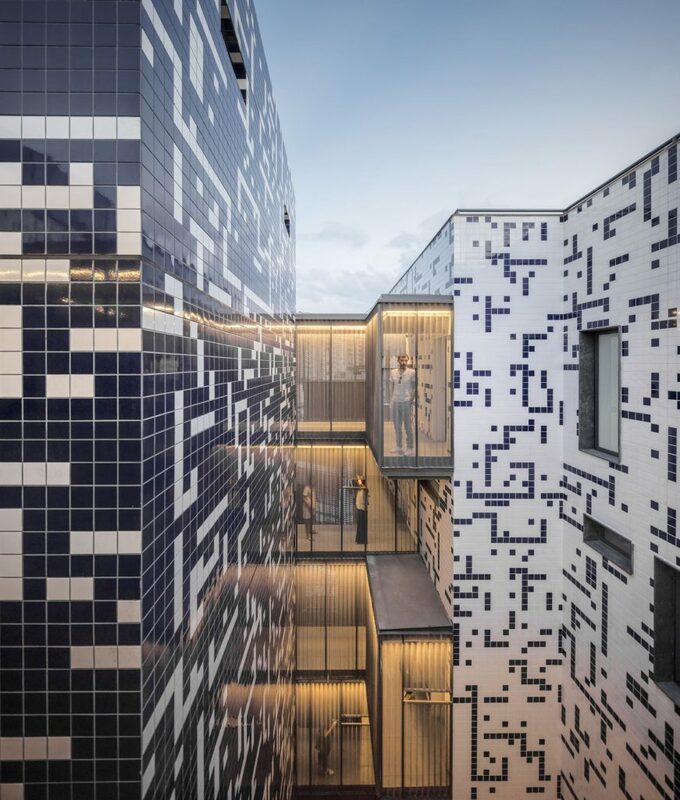 With integration being the main objective, establishing a natural dialogue between the 8,000m2 construction and its urban Hintergrund – a neighbourhood of old houses, bars, and restaurants – came as the project’s biggest challenge. 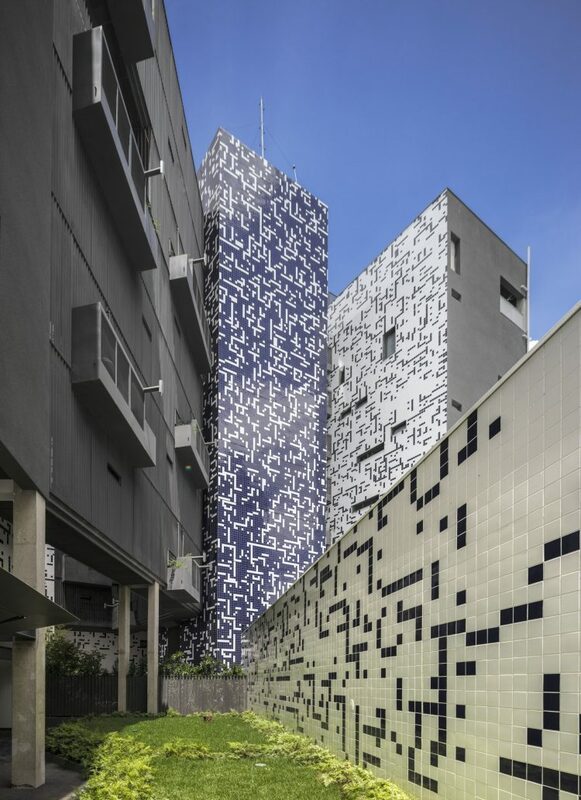 The collective memory of Vila Madalena is apparent in the project’s choice of materials. The predominance of projected concrete – a rough, rustic, and almost primitive material, graphite in colour – is a reference to the finishes used in the old constructions of the district. 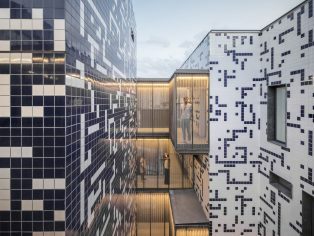 Further historical references are instilled through the use of ceramic tile, citing influence from the Portuguese – the first European diaspora to settle in the region. 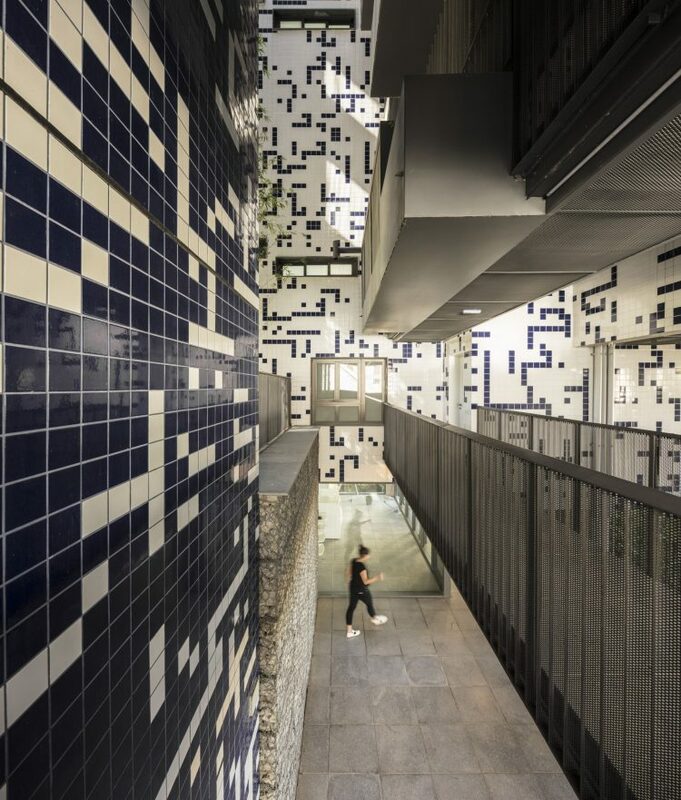 The blue and white azulejos, a tribute to the artist Athos Bulcão, envelop each of the internal façades. Smooth and reflective, they animate the façades while illuminating the centre of the ground. 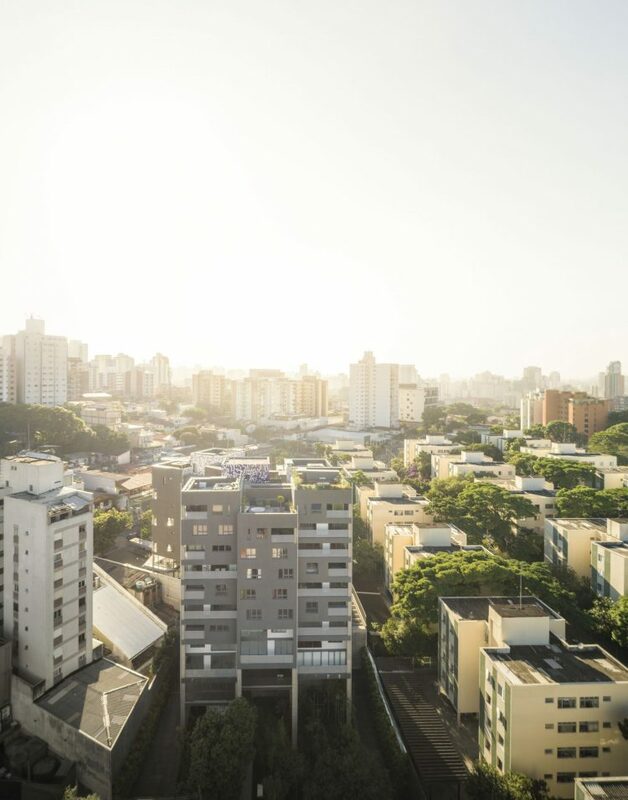 In addition, layered stone gabions bestow a sense of brutalism, harking back to the former paradigm of architecture which firmly took root in Brazil. The architects decided to split the complex, almost randomly, into eight blocks. Each block possesses an independent access, whose position guarantees the best view and optimises both ventilation and natural luminosity. A ninth block shelters the elevators, their shafts and the stairs, concentrating the exits of the metallic footbridges; a place of circulation and socialisation between the inhabitants. 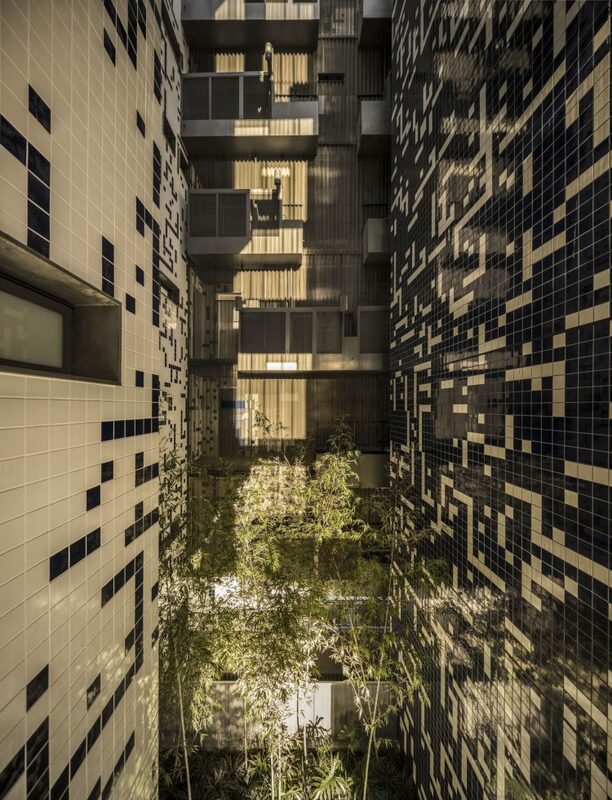 The result is a configuration of apartments allowing for privacy equal to independent houses. Vegetation also plays a central role in this project. 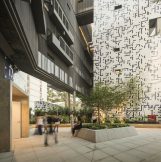 In the plats attached to the walkways, as in the ground-floor, the density creates a green environment at the foot of the building. At both entrances of the building, the porosity between the ground and the sidewalk creates a blurred boundary between public and private realms, revealing the generosity of the project as a whole.